If you've got the system and are even remotely interested in hockey, pick this one up! Tyler Wilde provides commentary followed by our original review of NHL 97 from the December 1996 issue of PC Gamer US. I have the flu. Thanks PAX . I very much wish I weren't a sweating, shivering slug monster, but it does mean I get to regress into delirious, selfish childhood for a few days. That's a perfect excuse to whine about the lack of team sports games on PC while celebrating something I don't get to write about much on PC Gamer—the NHL playoffs! I'm sick, I get the remote, and I'm putting on M*A*S*H after the Sharks game, so deal with it. The PC is master of racing, and there's FIFA and Football Manager and some golf games. But EA's NHL series hasn't been released on PC since NHL 09, while NBA Live 08 and Madden NFL 08 were the last of their kind on our platform. Even fewer 2K Sports games made it to PC, and the nature of sports games and licensing means they've since evaporated. The PC is a sports desert. Things were looking good in 1996 when we reviewed NHL 97 and boasted that "top of the line PC sports games are now superior to their console counterparts." It even holds up visually, kind of—the low-poly models look a bit like they could be modern retro. What hockey on PC looks like now, though, is a single, sad NHL game in the Origin library. NHL 09 is a fine game, but at five years old it doesn't carry much classic charm, just the sad state of being last . I get it: sports are mass market, consoles are mass market, voilà. Go where people are buying. I just drank some cough syrup, though, and right now I'm willing to bet that the PC is a great place for licensed sports games if done with modern sensibilities: online multiplayer, tournaments, leaderboards, a healthy metagame with updating rosters, and a business model that makes more sense than selling a new game every year. Or hell, it doesn't even have to be licensed—as long as the Predatory Fish beat the Joffrey Baratheons tonight, I'll be happy. EA's excellent hockey series just got better than ever with the hardest hitting action in the world. NHL 97 is the best example of this. This is, quite simply, one of the most realistic sports game ever done, in terms of look and play. 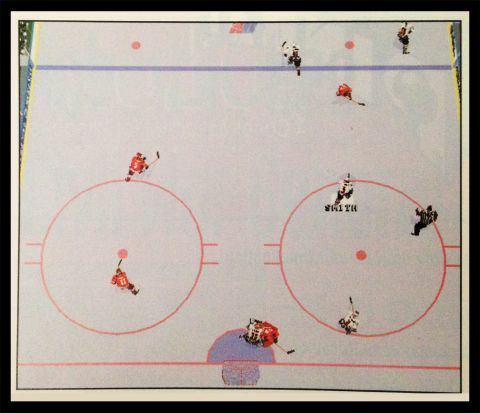 The secret behind NHL 97's seductive appeal starts with the graphics. They are the best in you'll find in an action oriented sport game, period. The virtual stadium technology that made its appearance in NHL '96 returns in a sharpened and more fluid form, with more intuitive camera views and a proper overhead view that recreates the “classic” view of earlier games. But the big difference this time out is that the bit-mapped players have been replaced with extremely lifelike motion-captured polygonal characters. Although sports sim fans may not really care whether the players are fast-moving 3D polygon characters are the defining characteristic of quality action games these days, a la Quake. But the fully rendered polygon characters in NHL 97 are sharper, faster and smarter than the characters in Quake. Thanks to a wealth of motion-captured data the NHL 97 players glide, slide, check and shoot, just like the real thing. They do one-timers, sprawl in front of the net, and even fight. Like previous games you'll control the action with a gamepad, and all the different actions that you need to do are controlled with only two buttons. Score one for simplicity, but this does mean that a lot of times you will be pounding on a button to speed up or check, only to have another of your players take control of the puck and then fire off a shot or pass you didn't intend. The artificial intelligence of the players is commendable, in that the players move where they're supposed to go and set themselves up for rebound shots and passing plays. And when they do stupid things—such as rush offsides or make two-line passes, it is because the game is taking into account player ratings, and the bad players make far more mistakes than the better players. All the player motions are quick and fluid, with stunning goalie moves, exceptional checks and realistic stick handling. During the fights however, the characters are slow and move like zombies. They stand there, locked with their opponents, getting slugged repeatedly, but that doesn't matter. It detracts nothing from the actual game itself. It's a bonus feature that didn't quite work out, and you can always turn fights off. You can also check and hook, though with the various penalty settings, whether or not you get called for your dirty tactics is up to you, as there are half-a-dozen levels of penalty-calling to choose from. Let's just say that the satisfaction you get from checking someone driving on your goal—in both visual and audio effects—is more accurate, more violent, and faster than any tackle or slide or dunk in any other sports game. Last month we had our sports awards; had this game been ready then, NHL 97 would have won the gold. The way to play this game is at the Pro or All-Star setting, with the line options on manual. You really cannot appreciate hockey strategy without the tiring of the lines, and this game takes that squarely into account. The game can be played head-to-head on one or two PCs (using the built-in local area network, TCP/IP, or modem options), and using a Gravis GrIP system, up to eight people can go at it in true team fashion. There's little in this game to criticize, but even a diamond has flaws, however minute. EA focuses far more on in-game play and the recreation of the pageantry of pro sports, without the detailed management options and customizability of other sports sims. In NHL 97, you don't have the ability to make your own leagues, stats, uniforms, or plays as you would in the Front Page Sports series, for example, and you're not going to be going on the Internet downloading new teams and leagues, although you can create new players and trade them with other teams. The AI also seems to be slanted to keep even bad teams in the game, especially on their home ice.